Wooden doors are used in our homes traditionally. They are attractive, durable and provide safety to homes. These doors are easy to make and are preferred for their carved designs. Easy availability of timber, less cost and attractive look make them superior to other doors. Wooden doors are available in many types, such as Flush Doors, Paneled Door, Glazed Doors, and Wire Gauge Doors etc. 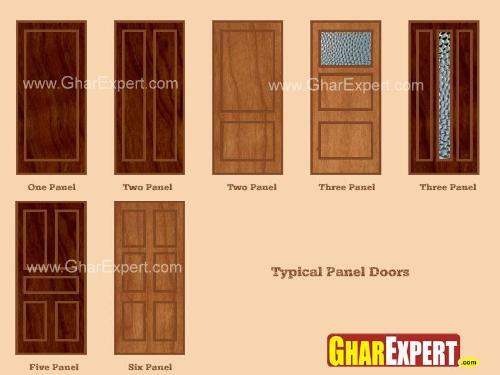 Panel doors are widely used in construction work. They are quite popular for numerous reasons. Panel doors are hard and offer extra beauty to doors of home. There are lots of options available for panel doors. You can easily find panel door with single panel, double panel, three panels, six panels, etc. Panel doors are hard and strong so they are used as exterior doors. They are more elegance and natural beauty. They can be made to any design as architect requirement. They can be made easily in any shape. They also hold up better in the everyday use. It is very difficult to accidentally punch a hole in a panel door. They also typically require less maintenance. They are weather proof as compare to other doors. They can be finish with paint or polish as per requirement. They provide privacy in homes as more sound proof. Hollow core solid panel doors are less expensive. Hollow core solid panel doors are lighter in weight. Solid panel doors are costly. They need more daily cleaning as dust retain more on the door as compare to flush door.